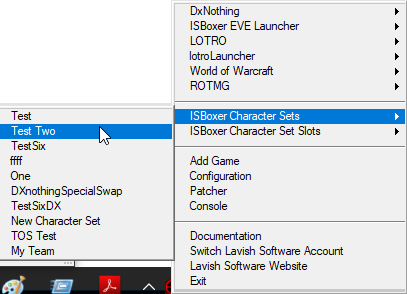 When I right click on my character set in isBoxer, and choose launch (or launch slot) it doesn't ever launch anything. The characters each have the game and profile configured. I am able to launch the game via innerspace 3 times, then go back to isboxer and choose launch and it will take over the 3 windows I launched with innerspace and everything seems to work. So I have a workaround, just wondering why the launch capability from within isboxer isn't working. Hoping I am missing something simple/stupid. The game in question is everquest2, but I don't think it's specific to that game so posting here. Launching from within the toolkit is not always reliable. In fact it is the least reliable of the 3 methods outlined in the quick start guides. The most reliable method is to right click the InnerSpace icon in the system tray, select ISBoxer Character Sets -> Name of your team. Second most reliable is to create a shortcut icon (right click the Character Set in the toolkit, and select the Create Shortcut option), then use this shortcut from your Desktop (or wherever you decide to put it). Least reliable, right click in the toolkit, and select Launch. You actually sound like you are using the default profiles from InnerSpace, which are not under ISBoxer control. To launch from InnerSpace, with ISBoxer, use the ISBoxer submenus. Unfortunately none of those three options do anything for me. The only way I can get it to work is to right click on the innerspace icon, Everquest II->Everquest 2 client 3 times, this opens 3 client windows that aren't in the right spot/resolution then I go in isboxer and right click the character set and say launch and it "takes over" the management of the windows and everything works. Doing any of the three things below opens/does nothing. I'm fine doing it this way, its just one little extra step, just would like to know why the other stuff doesn't work. And that is not launching the games (or launcher for the games) correctly, then get a compatibility diagnostic, as it sounds like something is interfering with the game launch. 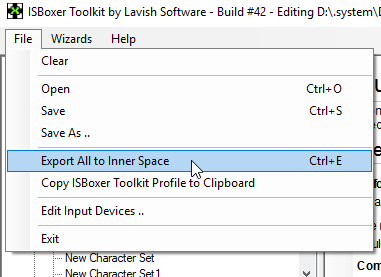 If you don't have an ISBoxer Character Sets submenu, then you need to use the File -> Export to InnerSpace option in the toolkit. I don't understand the technology well enough to really understand, but I am confused why I can launch it directly from innerspace but the launch menu in isboxer doesn't work. Are you saying there could be a compatbility issue that stops isboxer from calling the launcher but not innerspace? I.E. 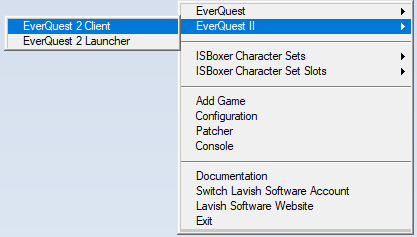 this works to launch the eq2 client (from the innerspace right click menu). I am at work now so can't start the client and do a full compatibility diagnostic but can do it later tonight.